Ford Motor Co. has announced that it will be shutting down its plant in São Bernardo, Brazil as part of the company’s $11 billion global restructuring efforts. Although President Jair Bolsonaro’s administration has promised business-friendly policies that have boosted consumer confidence to a multi-year high, Ford’s total earnings fell substantially last year, with a reported loss of $678 million in South America. Ford’s President and CEO Jim Hackett is leading the company’s global restructuring. As rising regulatory expenses in Brazil threaten Ford’s profitability, Hackett has emphasized the strength of Ford’s commercial truck business in other parts of the world. Is Latin American e-commerce platform MercadoLibre the next PayPal? Latin American e-commerce retailer MercadoLibre is making strides in the payments and fintech sectors. For the first time, the company’s payments operation, MercadoPago, showed an outperformance in its “off platform” payments (merchant services, mobile points of sales, wallet payments, etc.) vs. the company’s online marketplace platform. 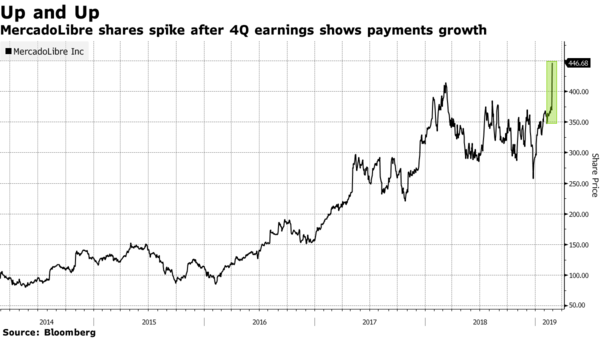 MercadoLibre shares spiked in fourth quarter earnings, rising up to 22%: the company’s highest level ever. MercadoLibre’s growth has reminded some analysts of the growth trajectory of PayPal, which was originally purchased in 2002 by EBay as a payments service but eventually outgrow the parent company threefold. “While MercadoPago is part of the larger company with a market cap of $20 billion, analysts like HSBC’s Ravi Jain have used the multiples of its payments competitors in Brazil – which is MercadoLibre’s largest market – to estimate that MercadoPago could be worth as much as $8 billion on its own” (Bloomberg). TheFork, a restaurant reservation platform owned by TripAdvisor, acquired Restorando in efforts to expand its Latin American presence. Restorando, founded in 2011, has a user base of over 4.5 million people in Latin America per year. This acquisition will expand TheFork’s reach into eight countries including Argentina, Mexico, Colombia, Uruguay, Panama, Chile, Peru and Brazil. PhocusWire reports that “the acquisition will add 3,500 bookable restaurants to TheFork’s network, bringing the platform’s total number of bookable restaurants around the globe to 60,000”. On February 25, The British Foreign Policy Group held an event entitled The Future of UK-Latin American and Caribbean Trade after Brexit. Panel members included Ambassadors, Minister Counsellors, and Trade Representatives from a dozen LatAm countries as well as International Relations scholars and professors. The panel reached a general consensus that the problem inhibiting an increase in trade between the regions is not distance or a lack of appetite from LatAm market. The focus instead should involve changing perceptions about LatAm trade in the UK. Representatives expressed the importance of continuing to increase Latin America’s voice in international institutions like the OECD to help improve overall attitudes. However, panel members expressed positive outlooks looking about the capacity of cultural cooperation in the future to help improve post-Brexit relations. Beginning March 1, an upgraded China-Chile FTA will open new opportunities for foreign investors and expand bilateral trade. In 2016, Chilean exports to China were over double the value of Chile’s exports to the U.S. This updated FTA creates considerable opportunities for Chilean businesses operating in Chinese markets. The food sector will be especially profitable, as the FTA allows free export from Chile to China while local Chinese production cannot keep up with the Chinese population’s internal demand. A combination of recovering economies and growth in e-commerce creates a high flow of goods throughout LatAm, therefore increasing logistics revenues. LatAm logistics companies are responding to this e-commerce boom by changing warehouse approaches, introducing warehouse automation using robots, and utilizing big data and analytics to analyze how their fleets operate in efforts to increase efficiency. A problem that LatAm logistics must confront, however, is the issue of high return rates for products purchased via e-commerce. Previous issues of our LatAm Newsletter have discussed the state of crisis in Venezuela. Under the presidency of Hugo Chávez, Venezuela was the richest economy in Latin America with huge oil reserves. Today, however, the country has entered an economic and humanitarian crisis. This video by CNBC provides a timeline of the turmoil in Venezuela and insight on international intervention and potential futures for the nation.